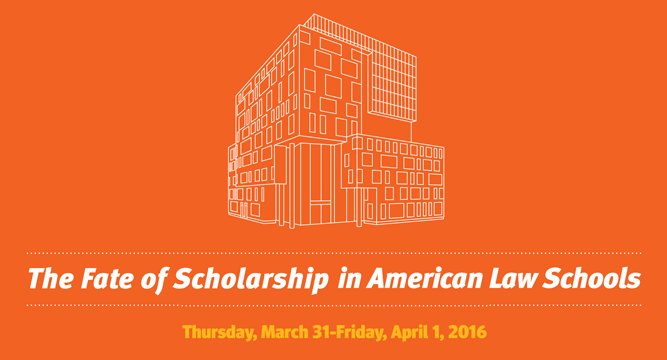 The University of Baltimore School of Law hosted this groundbreaking conference on March 31 and April 1, 2016, at UB’s landmark new John and Frances Angelos Law Center in midtown Baltimore. As American legal education faces an identity crisis, what will become of scholarship in U.S. law schools? Will it survive the tumult – should it survive – and in what form? The conference reexamined first principles of legal scholarship – its value (to legal education, to the legal profession, to society) and its essential aspects – and surveyed particular issues of contemporary concern, including emerging scholarly forms and technologies and the relationship among legal scholarship, journalism and new media. The two-day conference consisted of themed plenary sessions, concurrent small-group sessions, opportunities to interact informally and keynote addresses by Jack M. Balkin , Knight Professor of Constitutional Law and the First Amendment at Yale Law School, and Kellye Y. Testy, the 2016 Association of American Law Schools president and Toni Rembe Dean and Professor of Law at the University of Washington School of Law.